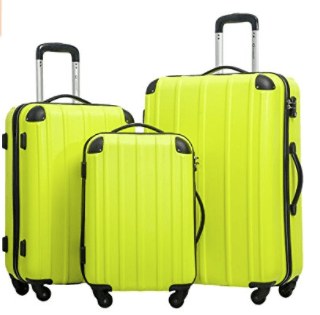 Merax Travelhouse is an expandable spinner set of three pieces of solid hard shell suitcases with TSA locks, a modern design and 9 different color options. As a popular product since its first release in September 2016, it scores 4.6 out of 5 stars on Amazon.com. Some of you may choose a different color than black and navy for the obvious reason of the ease of picking among many suitcases on the luggage carousel at the airport. These color options include black & rose, yellowish green & black, dark cyan & ivory, wine red, black & yellowish green, rose & black, gray & yellowish green, navy, and black. You have the 20-inch carry-on bag to take with you on the plane and put in the overhead locker, the medium 24-inch and the large 28-inch suitcase for checking in when you arrive at the airport. The material used on this hard shell luggage is the lightweight but sturdy, flexible and durable Polycarbonate and ABS that withstands impact especially by the bad treatment of airport luggage personnel. As you may see in the photos, each corner of these suitcases have the riveted protective shells that help increase the durability. The zippers on these bags are durable metal, not plastic. You can maneuver them into tight corners and areas smoothly and effortlessly with the solid spinner wheels that swivel 360 degrees quietly and ergonomic aluminum telescoping handles that lock at three points. The US TSA staff can check the contents of your luggage at the airport for security without giving any damage to the lock. These are key locks and each suitcase comes with two keys, and a total of six. TSA stands for Transport Security Association. Merax has roughly 23 years of history, offering customers great value day to day products in six different categories of home, office, fitness, pets, kids, and travel. Merax Travel category offers you a variety of different color and model suitcases with different features. 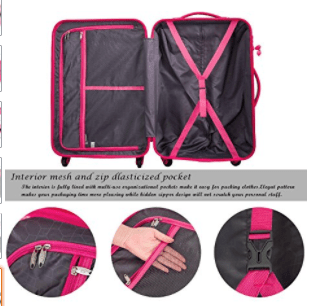 You’ll find different zippered pockets and cross straps on one side for organizing your belongings better. The 20” cabin bag weighs 6.2 pounds (33 lb. weight capacity) and measures 19 x 13 x 9 inches without the wheels. The medium 24” bag weighs 7.1 pounds (weight capacity of 44 lbs) with the measurements of 23 x 16 x 10 inches. And the largest 28” suitcase weighs 9 pounds (55 lb. weight capacity) and measures 27 x 19 x 11 inches. The set will be shipped to you with the bags fitted into each other conveniently. It is offered with a two-year free warranty by Merax and good customer support that will help you with any problems you may encounter. The medium and the large suitcases are expandable but not the small cabin bag. There is a confusion over whether these are the soft shell or hard shell bags. The composite molded solid plastic (ABS + Polycarbonate) is definitely hard shell than soft, but more flexible than the full hard shell, resisting the impact well. These are quite durable bags and customers report that they have not seen any dents or scratches on many travels. Merax Travelhouse is a functional, reliable and durable set with a contemporary design overall and that offers decent value for money.